Continuing where the previous post left of, we now come to the part of Volume 1 that gives some advice on how to play the game with your miniatures, a summary glance at waging war underground, rules for creatures and their special abilities, the first Warhammer scenario and the Bestiary. 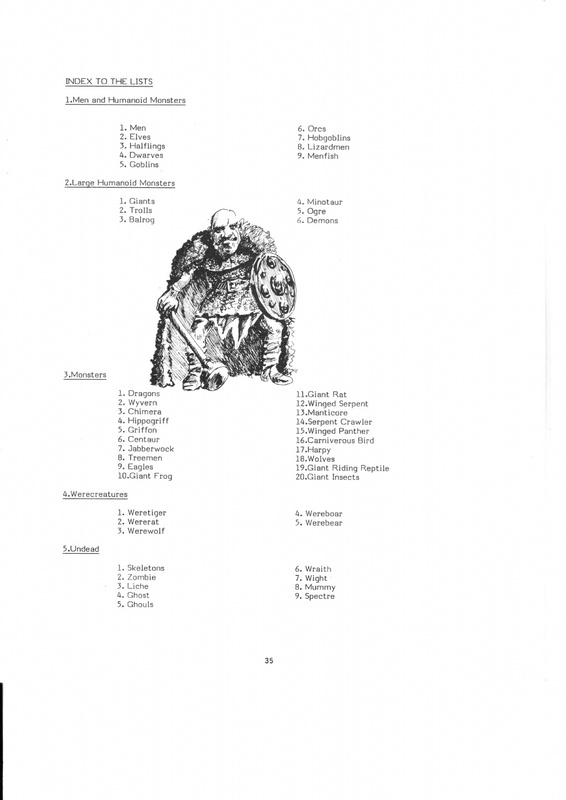 The original publication of Warhammer did not yet have a points system, so the eponymous chapter of the book (Table-top Battles), gives some general advice on table-top wargaming, i.e. how to lay-out a table using common sense (there's not much though). It's also the first time that the troop types and forming up of regiments is covered in more detail. even though the movement rules are written with ranked-up miniatures in mind, only on page 27 proper guidelines on how to form units are given. In Firsthammer it's only guidelines though, advising the use of regiments with homogeneous weapons and armour rather than mixed units whereas later editions required regiments to be homogeneous. Also in true wargaming fashion, the basing of troops is far more detailed and influential to the game than in later editions. It gives 4 base sizes: 15mm for small humanoids (halflings and lesser goblins), 20mm for 'normal' sized humanoids (dwarves, goblins, men and elves), 25mm for Orcs and hobgoblins, and 25x40mm for cavalry. Later editions did away with the 15mm base size. Large monsters do not have a predetermined base-size, the rules only state that these should be appropriate to the model's size. To add to this are the Base-size modifiers for Skirmishers (+50%) and Shock-troops (-5mm). A nice touch, giving a clear visual aid to what kind of troops you face, but not really practical with the models I and my friends own (all slottabase era save for a single regiment of Orcs found in a bargain-bin once). Note that there was not yet a "skirmish formation" as in the later editions, but skirmishers were in ranks, albeit with larger bases to make them stand out from standard and shock troops. Fighting in Dungeons is an important chapter for those of us (me) who want to use Firsthammer as RPG rules. The rules given are not as complete as one might wish for, though the chapter assumes the reader to have some familiarity with dungeon crawling roleplaying games. The rules for darkness and lights are well conceived. Flying Creatures are summarily handled in a one-page chapter, and are essentially the 4th/5th edition rules for flyers minus aerial combat and the 24" table-top-level flying (things I might add if it becomes relevant). Flying creatures are scary though, big initiative bonus, weapon length assumed as 'pike' and penalties to hit for enemies engaging them with melee and missile weapons. 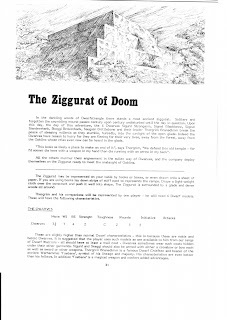 The Ziggurat of Doom is the first ever Warhammer scenario, pitting 6 Dwarf Heroes (pre-hero rules) against a horde of goblins. It is a nice little game really, in which the dwarfs must make good use of the Ziggurat to keep the waves of goblins at bay. The advantage seems to be firmly with the Dwarves though, despite goblin numeric superiority. This is because of their high Weapon Skill, 5 of the Dwarves being "accomplished" melee fighters, while their leader Thorgrim Branedimm is an "expert" hammer-wielder with a magic hammer that causes fear to enemies within 15". In fact, 6 named dwarves face of against a horde of nameless mooks, who must test against fear and have epic-level dice-luck to accomplish anything! The scenario objectives also skew in the favour of the Dwarves, as the goblins score 2 points for each Dwarf slain while the Dwarves score 1 point per turn survived with at least 1 Dwarf remaining. Effectively this means that the Goblins have 12 turns to wipe out the Dwarfs to win and 13 turns to get a draw. Any other outcome is a Dwarf Victory. Following the scenario is the Creature List which starts of with rules for Poison. I find the poison rules a bit off in that poison must be saved at using Strength rather than Toughness, which would be (to me) the obvious characteristic for such. Regeneration comes, next, being a bit different from later editions, the first incarnation of regeneration being a bit like AD&D as I experience in Baldur's Gate: lose all wounds but test each round if your monster regenerates. Animals are divided into non-intelligent creatures and semi-intelligent ones and are exempt from morale test but affected by fear, terror and hatred as applicable. Non-intelligent animals are subject to stupidity. The creatures provided in this part of the book get some summary descriptions, some being just what models are available to represent them. The number of creatures provided is sufficient for the rules-set, and it features some creatures that have since been removed from the Warhammer world... Menfish being the most famous example. There also used to be a large variety of were-creatures, winged animals, reptiles, amphibians, more goblin variants and several types of giant (no less than 8 sub-types of giant are given), very similar to the wealth of giant-types provided in (A)D&D. Chaotic attributes are mentioned in the creature lists for the first time, and pop-up now and again with certain creatures but are not described in the set at all. The first we will see of Warhammer's Realms of Chaos would be in the First Citadel Compendium. Most monstrous creatures are fittingly terrifying, the Balrog being king at that, with its fire-spells, epic characteristics (Maxed-out) and terrible fire-whip. Here the Balrog is pretty much presented as described in the works of JRR Tolkien and can be used as leaders for a small contingent of goblinoids and trolls. Dragons are to be found in various colours like in D&D. Interesting hook here are the possibilities of Dragons being Intelligent rather than semi-intelligent and having magical abilities. Also lifted straight from D&D I presume, but very neat for dragon-based adventures and battles. The rules for the various dragons span the better part of 3 pages. What I miss in this part of the rules however, are the heroes and individuals. you only get basic creatures and only a slight glimpse on heroic humanoids in the scenario... Well, except for Balrogs and Liches- hm... there could be a cool scenario in a battle between a Balrog and Liche who each have a bunch of suitable units under ther command. So, that's the entirety of Volume 1: Tabletop battles. overall a nice set of unpolished but playable rules if you ask me. It does require a good measure of Game Master and Player creativity to be used to full effect and would need some house rules, especially the weapon bonuses vs troop-types if used as RPG.